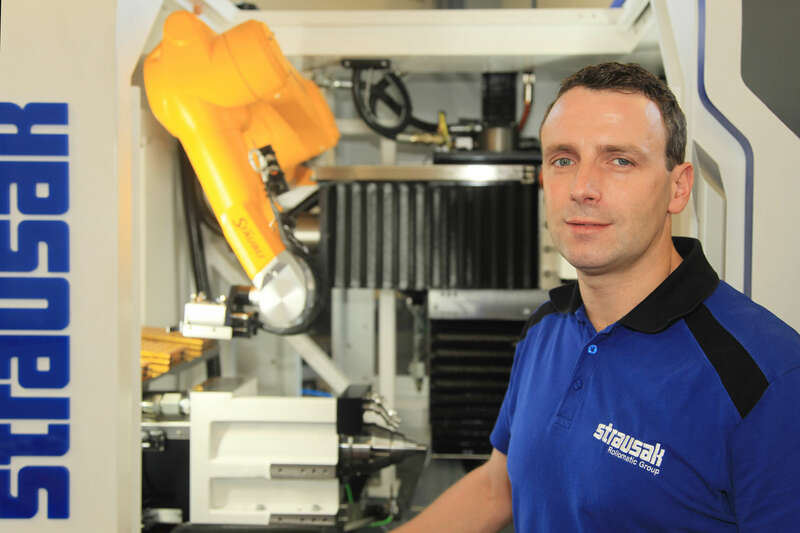 The Stäubli robot arm automates the loading of the tool holder in the Strausak grinding machine. For people, it’s a matter of innate feeling and a task they perform with ease—inserting objects accurately into an appropriately shaped holder. 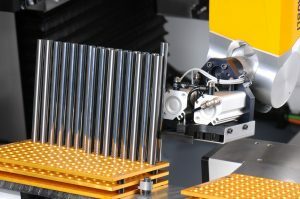 For the grinding machine producer Strausak, the robot manufacturer Stäubli and the encoder supplier HEIDENHAIN, the insertion of cylindrical tools into tool holders with a robot arm was a real challenge—and therefore a task made to measure. “Before this product I would never have believed that such pinpoint sequences of motion could be carried out so successfully with an industrial robot,” said Strausak Managing Director Alexandre Condrau, who still marvels to this day. Moving objects from A to B and back initially seems to be no big deal. That is, if it weren’t for the demands regarding accuracy of fit of the tool holders and the tight loading of the tool pallets. The Swiss company Strausak AG enjoys an outstanding reputation for its machines for the grinding and re-sharpening of tools. 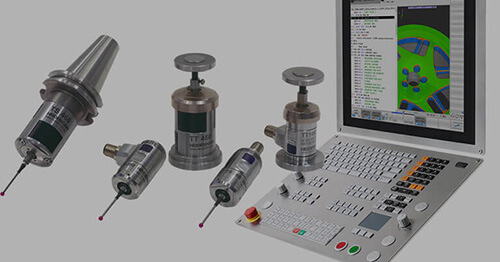 Their U-Grind range is ideal for the grinding of special tools and regrinding, i.e. for small batches frequently requiring the production of complex geometries. On the face of it this would not be a typical application for robotic automation solutions. When looked at more closely though it quickly becomes apparent why the robot solution has proven to be so popular with Strausak customers. The complex grinding sequences that run on Strausak U-Grind machines usually take considerable time. The carbide metal tool material and complex geometries mean that the grinding of a small series of five special tools may take several hours. 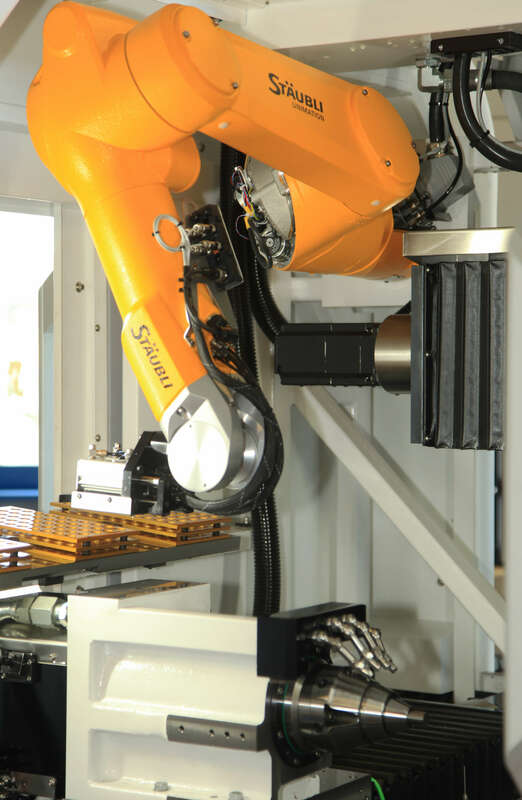 The automation solution however with the pick-and-place robot makes operator-free shifts possible. 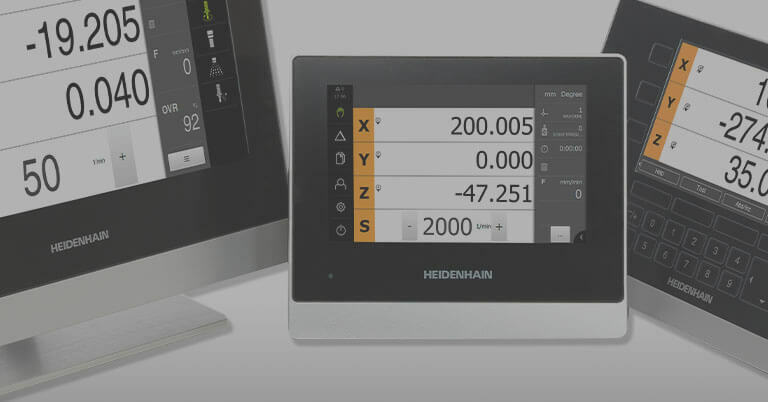 On each axis of the robot arm, inductive HEIDENHAIN rotary encoders of type EQI 1100 measure the current position. The task of the robot arm on the grinding machine consists of removing a tool for regrinding or a blank form from a pallet and inserting it into the grinding fixture’s tool holder. After the grinding sequence, this process is then of course executed in reverse order—the robot removes the sharpened tool from the holder and places it back into a pallet in the intended location hole. However, the devil is found in the detail. 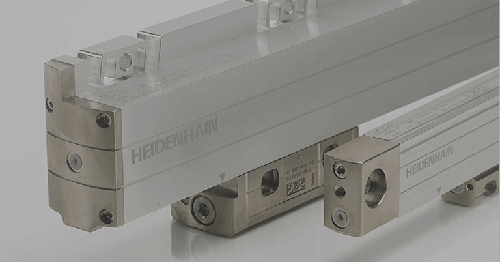 While conventional collets still have automation-friendly tolerances, the frequently used hydraulic expansion chucks are a genuine challenge for the robot because they have diameter tolerances of only a few hundredths of a millimeter. Removing the tool on the tightly loaded pallet, moving it to the tool holder and inserting it in the holder is also a highly complex precision motion for the robot. All six axes need to be interpolated to enable implementation of the straight-line insertion and deposition movements. The permissible deviations in each of the six axes are very limited in this context, because only in this way can the process be reliably controlled. To grip a tool on the tightly loaded pallet—in this case for 150 tools with diameters of 10 mm—the robot arm must be moved with high accuracy. 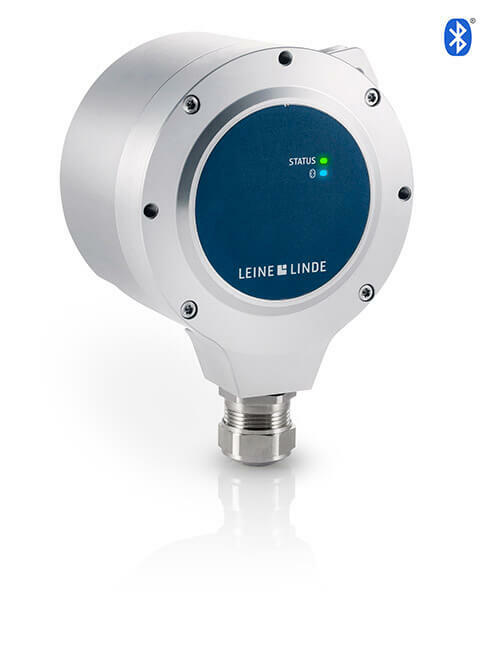 Stäubli uses HEIDENHAIN absolute inductive rotary encoders of type EQI 1100 with 18-bit resolution on the robot for the Strausak machine on the axis drives. One rotary encoder sits on each axis. These supply position data with the necessary accuracy to guide the gripper on the tip of the robot arm so that it can reliably remove the tool from the tightly loaded pallet, insert it precisely into the tool holder and then return it to the pallet after machining. 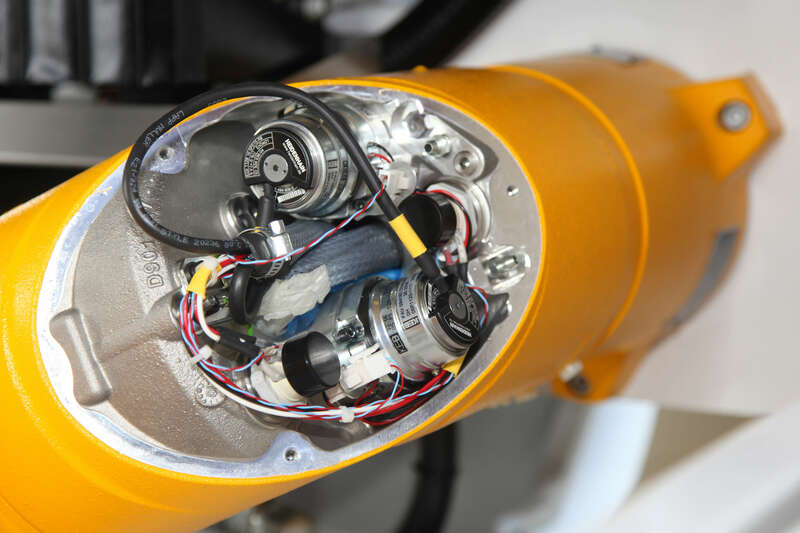 For this purpose, the robot needs to achieve a positioning accuracy of 50 µm at the tip of its gripper. The absolute position data are an essential factor for success. The machine control, via which not only the grinding sequence but also the robot is controlled, is aware of the precise position of the robot arm in the working space with this data. Homing the robot is to all intents and purposes superfluous and collisions caused by still undetermined positions can be avoided. 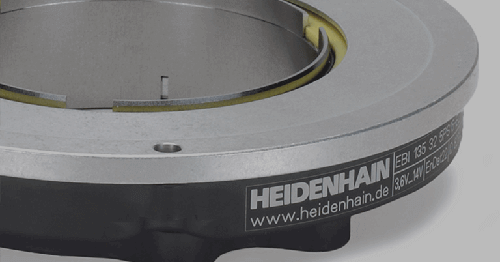 Due to their inductive measuring principle, HEIDENHAIN rotary encoders have highly compact dimensions, making them ideal for the extremely tight space conditions in the robot arm. 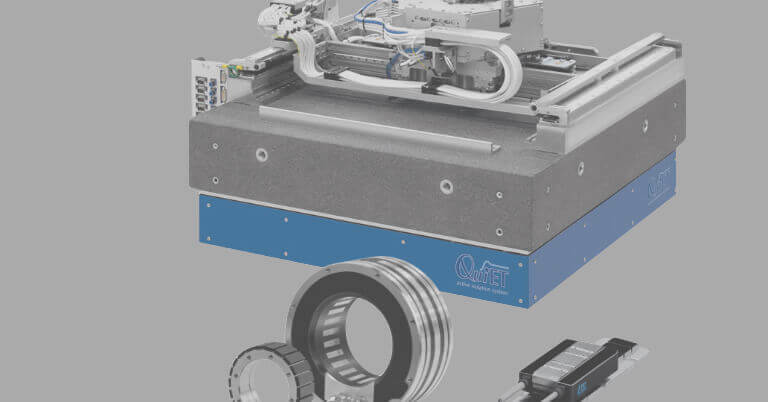 The smallest possible space requirement of the robot arm in the working space was also an important criterion for Strausak when selecting the supplier. “We definitely wanted to integrate the robot arm into the existing, already quite full working space. To achieve that, its kinematics had to enable complete movability within a very tight volume. Another factor was the robot arm in its rest position should not limit access to the working space,” explained Alexandre Condrau concerning the complex requirements. “Many of our customers are small companies or even one-man operations. They need functional technology that’s easy to operate and that supports them as much as possible in their tasks. We’ve achieved this with the robot,” said Alexandre Condrau about the current status quo. 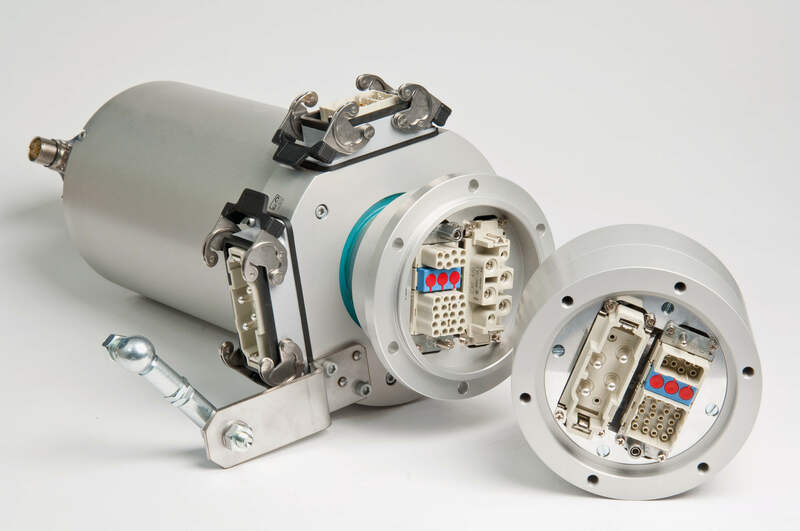 Strausak also sees further development possibilities that could help its customers even more. “We’re currently working on the robot following up and regripping when it inserts very long tools into the tool holders. It would also be highly interesting for customers if the robot could not only change the tools but the holders as well,” explained Alexandre Condrau with a view to the near future. 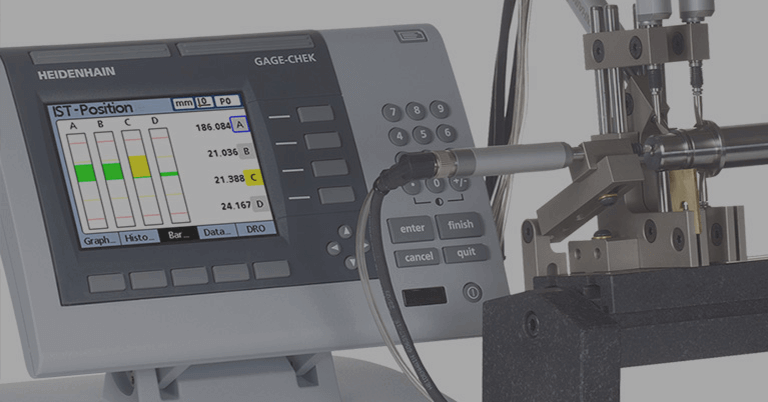 This would then enable tools with differing shaft diameters to be handled without the need for any intermediate manual configuration of the tool holder.